I snuck in some crafting time this morning - such a busy week already! 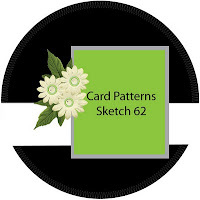 I saw this sketch from Card Patterns and was really inspired to create. Round cards appeal to me as they are such a fun change. I love shape cards, and this one is just perfect. I love the pearls to give it the elegant look. Gorgeous!!!! Love the pop of red that flower gives!! Stunning, I agree with Jamie, I'm crazy about that pop of red...and the embossing! love it! This is just stunning Brenda! I love those deep colors you used. Beautiful, SO elegant! Love it!